When you are ready to go hunting for the first time, there are a few things you must consider. One of our favorite ex-marines, Jeremy Pozderac, is here to help. 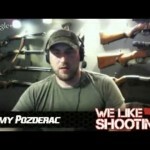 And we know anyone from the We Like Shooting Podcast is certainly a excellent resource! Today we tap into his knowledge about firearms and hunting in Texas vs. Ohio. Now... can he behave long enough for us to learn something from him? We shall see... Welcome to the Fat2fit HQ podcast! I’m your host Carol Salva of the Firearms Radio Network. In this podcast we are chronicling our journey from Fat 2 Fit. We talk about pursuing a healthier lifestyle, not only in diet, but in all areas of life. Sorry it has been so long. Thank you to everyone in the myfitnesspal group. Even when I'm pod-fading, I know we can all connect over there on a regular basis. Here is the latest..
Jeremy has been supporting Carol in her pursuit of purchasing a firearm for a while now. Listen in to find out what words of wisdom he has and where Carol has landed in her firearms purchase journey.